I don’t know a whole lot about Buddy Holly, but I did see La Bamba, so I know that he died in a terrible plane crash along with Ritchie Valens and The Big Bopper. I also know that in only a year and a half, the 22 year old and eventual Rock and Roll Hall of Famer recorded some of the most memorable pop songs of his generation. Songs so memorable that even the casual music listener has probably heard: “That’ll Be the Day”, “Peggy Sue”, “Oh Boy”, “Maybe Baby” and “Everyday”. 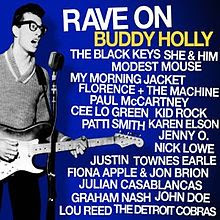 Well for better or worse an album, titled Rave On Buddy Holly, was recently released (June 28) and I mention this because of the all-star line up featuring contemporary artists such as The Black Keys, Fiona Apple, Florence + the Machine, Cee Lo Green, Karen Elson, Julian Casablancas, Justin Townes Earle, She & Him, My Morning Jacket and Modest Mouse, as well as legendary rockers Paul McCartney, Patti Smith, Lou Reed and Graham Nash. I know most compilation albums are not that good but look at it this way, maybe you'll find out that you like the original Holly songs better and for that you can thank me later.